What??? $7.99 for this mountain-grown 100% Montepulciano? Yes indeed. The prior vintage if this wine has enjoyed plenty of much-deserved praise on these pages in years past. So, when I spotted this priced at $7.99, I figured there had to be something wrong with this vintage. Well, I figured incorrectly. While perhaps not as refined and poised as the 2010, this wine oozes likability. Deep red with an unapologetic density, it unwinds easily on the tongue with an appealing casualness. But it is also pretty in an effortless, devil-may-care way. 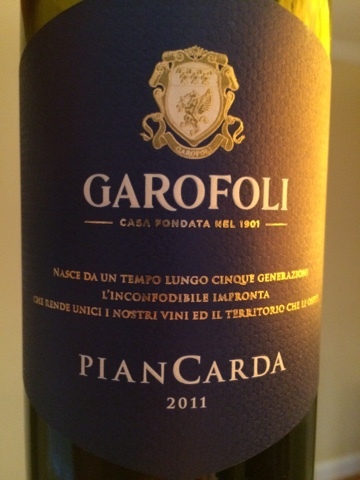 Soft, round, and lush, it finishes with enough tannic grip to keep its structure intact. And at this price, you'd be a fool not to buy it by the case. In the Columbus, Ohio market, you'll find it at Anderson's. But hurry.